In Tripoli today, there is a seemingly secure peace that has taken hold in areas recently emerged from rounds of armed violence. Gunshots and explosions from battling groups no longer ring out from the streets and rooftops – though, the almost daily round of fireworks are deceiving. Yet, many wonder if the conflict that ravaged parts of their city has truly come to an end or if tensions are merely temporarily pacified. As with so much in Lebanon, the answer is complicated by myriad factors from backdoor political dealings and the legacy of the Lebanese Civil War to regional power dynamics. For generations, Tripoli’s economy was centered around its large port, and competed with the capital Beirut. However, shifts in the global macroeconomy coupled with regional political developments drove commerce away from the port starting in the mid-20th century and culminating in the Lebanese Civil War. Its proximity, cultural affiliation, and economic largesse drove Tripoli’s considerable commercial ties to neighboring regions in Syria, including cities devastated by the Syrian Civil War such as Hama and Homs. These economic shifts, political upheavals, and decades of conflict have put Tripoli on an economic downturn from which it is struggling to recover. This decline has hit neighborhoods such as Bab el-Tebbeneh and Jabal Mohsen particularly hard. These, along with other political, social, and religious factors drove a considerable increase in tensions among hard-off sectarian communities, including those in Bab el-Tebbeneh and Jabal Mohsen. From 2008 to 2014, tensions manifested themselves in open armed conflict primarily between the neighborhoods of Bab el-Tebbeneh and Jabal Mohsen. The conflict between the predominantly Sunni neighborhood of Bab el-Tebbeneh, and the majority Alawite neighborhood of Jabal Mohsen, was many things all at once. While the sectarian divide is an obvious focal point given the nature of the Syrian Civil War raging only a few miles away, sectarianism is simply an insufficient mechanism to explain such a complex conflict. Though the conflict is often framed as stemming from the simmering animosity left over from the Lebanese Civil War, current local and regional politics are equally responsible for the most recent outbreak of violence. It is still important, however, to understand the history of northern Lebanon because it underscores the narratives used to drive the conflict on a local level. During the Lebanese Civil War, multiple armed factions used Tripoli as a base of operations, including the Sunni aligned Palestinian Liberation Organization (PLO) led by Yasser Arafat and later the Islamic Unification Movement (Harakat al-Tawhid al-Islami). Syrian forces, allied with the Lebanese Alawite population, occupied northern Lebanon beginning in 1976, effectively dominating Tripoli’s political scene. The Syrian occupation pitted the overwhelmingly Sunni population against their Alawite neighbors, exemplified by Sunni support for resistance groups, such as the PLO and later the Tawhid Movement. Syrian forces and local Alawite militias in Tripoli affiliated with the Arab Democratic Party retaliated in December 1986 by conducting a large-scale massacre of the Sunni population in Bab el-Tebbeneh, killing hundreds. This event, and the Alawites participation in it, remains engrained in the collective memory of the Sunni community in Tripoli as one supported by their Alawite neighbors in Jabal Mohsen. 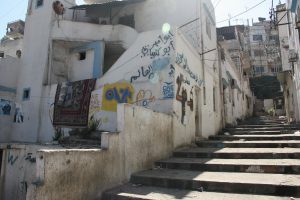 As a result of the socio-economic deprivation of the Sunnis in Bab el-Tebbeneh, the violence inflicted upon the community, and leadership failure of the traditional Sunni political elites, Islamist movements such as the Tawhid Movement became focal points for Sunni grievance and mobilization. Since the 1990s, fundamentalist Islamist groups in Tripoli have become more integrated into global jihadi networks, gaining attention in the context of different local and global political struggles. Syrian forces withdrew from Lebanon in 2005 after being implicated – alongside several other Lebanese movements including the Shi’a-led organization, Hezbollah – in the assassination of prime minister Rafik Hariri. The departure of Syrian forces coupled with political fragmentation and financial crises among Sunni political elite, particularly Hariri’s Future Movement, allowed Sunni Islamist movements to operate more freely within Tripoli’s political arena. 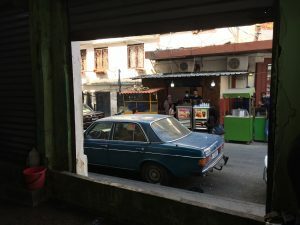 By May 2008, already deteriorating conditions reached a tipping point when Hezbollah-led fighters seized control of several Beirut neighborhoods, engaging in armed clashes with the Future Movement. 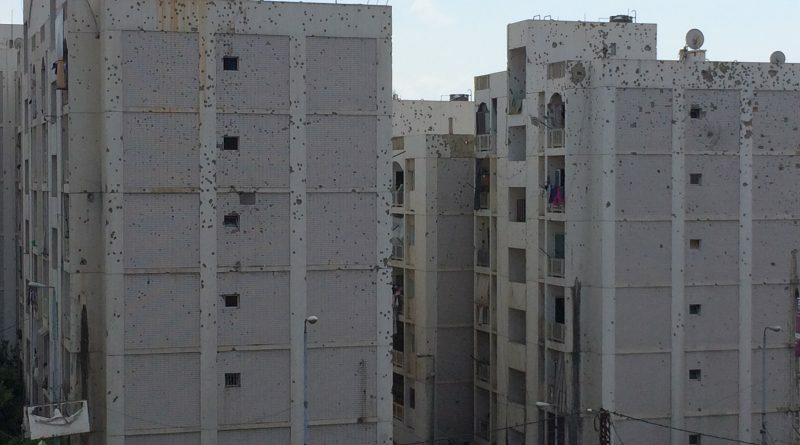 Those events triggered the first armed clashes in Tripoli since the civil war, when fighters in Bab el-Tebbeneh opened fire on Jabal Mohsen, which shares a close relationship with Hezbollah. Furthermore, the events of May 2008 further fragmented Sunni political leadership, and many in Tripoli’s population distanced themselves from the Future Movement. The skepticism with which many Sunnis viewed Dar el Fatwa – the Lebanese Sunni religious institution – provided further fertile ground for Islamist movement to establish new rival political institutions and networks. An inviting space emerged for religious leaders of these newly introduced networks to infuse their sermons with political messages aimed at garnering votes from the population in exchange for funding and services provided by political parties. In recent years, the city has increasingly suffered from high unemployment, low education rates, and low investment – creating wide disparities in wealth that are readily apparent. Such disparity is particularly apparent in Bab el-Tebbeneh, which is among the most marginalized communities in an already marginalized city. All of these factors facilitated the mobilization of youth to participate in Tripoli’s armed clashes. Engaging in armed violence represented an economic opportunity for these communities that they otherwise would have lacked. Former fighters reported being paid as little as 50,000 LL (~$33) per day to throw grenades across the frontlines, and comparable amounts to open fire. While reasons for youth participation varied, these funds permitted young men to survive and feed their families. Ultimately, the driving force behind the clashes were born out of the current political climate, which saw the use of historical animosity and current economic, political, and religious dissatisfaction to fuel backdoor politicking. Understanding the degree to which both the underlying political drivers of the conflict as well as the facilitating conditions have been addressed is critical to understanding the possibility of relapse into violence. Put simply, the conflict was fostered and managed by elites within the Lebanese political community and supported by their competing regional political blocs – a view which has been reaffirmed by myriad local experts and city residents. Since the end of the civil war, political parties have been forbidden from maintaining armed militias, prompting political leaders to circumvent this law by using local armed fighters as proxies to influence national politics, and send political messages to their rivals. Fighting between Bab el-Tebbeneh and Jabal Mohsen was limited in scope, and tightly controlled by these elites. This urban violence was never about gaining territory or inflicting maximum casualties to ‘defeat’ the other side, and total deaths as a result of the 6-year conflict hover around 220, a portion of which were non-combatants, according to local sources. Lebanese security forces have a long history of sectarian division and old allegiances that drive their relationship with the civilian society and the political establishment more broadly. Multiple local experts and former combatants have claimed that units within the Lebanese Armed Forces (LAF) along with the formerly-Sunni dominated Internal Security Forces (ISF) became involved in managing the clashes from either side based on sectarian allegiances and in close coordination with the local elites. According to these same sources, the various political factions driving the conflict took advantage of the existing network of neighborhood militias composed mainly of “zaaran” or street thugs that were formed primarily around geography, but also rooted in political or religious identities. In Jabal Mohsen, the Alawite command structure was centralized under the Arab Democratic Party (ADP) led by Rifaat Eid. The ADP was, and remains, closely aligned with the Syrian government and Hezbollah, both of whom supplied funding and arms to its militias. Further, the military and intelligence capabilities of militias operating in Jabal Mohsen were allegedly bolstered by support from Shi’a-aligned factions within the LAF. In Bab el-Tebbeneh, militias were organized in a more decentralized structure, usually by geography. Nearly every cross-street leading to the “mehwar” or front line on Syria Street had its own militia. According to local sources, this decentralization is a reflection of the fragmented nature of Sunni political structures at both the local and national levels. In spite of this intra-confessional competition, the Future Movement, including under the leadership of both Saad Hariri and Najib Miqati and with significant support from Saudi Arabia, was reported to have provided significant financial support for militias in Bab el-Tebbeneh. By providing money for these militias to purchase their own weapons from sources that include Hezbollah and arms en route to Syria, Hariri has been able to maintain a level of plausible deniability that the Future Movement provided weapons to perpetuate Tripoli’s conflict. By 2012, the conflict in Tripoli had reached a new level of intensity. Following the outbreak of civil war in Syria in 2011, spillover effects contributed to Tripoli’s political fragmentation, poverty, and economic deprivation. Armed clashes, “aalqat” between Bab el-Tebbeneh and Jabal Mohsen became more frequent, and increasingly resembled the political proxy dynamics not only of Tripoli, but of the Syrian Civil War, as well. Fighters in Tripoli became more entrenched in their religious and political identities with Jabal Mohsen aligning with the Assad regime and Hezbollah, and Bab el-Tebbeneh aligning with Sunni opposition forces fighting the regime and its allies. At first, much of the Sunni community supported the Free Syrian Army, but by 2014 dynamics had shifted, and Islamic extremist groups like ISIS and Jabhat al-Nusra had established clandestine networks in Tripoli. Based on conversations with Sunni youth involved in the Tripoli clashes, some had considered joining these groups to fight in Syria, or knew someone who had. Many cited being drawn to the idea of an Islamic utopia where they could live with dignity and earn a living – in stark contrast to the lack of opportunity, and marginalization they felt at home. After allowing the conflict to continue for five years, experts agreed in interviews that the decision to finally implement a comprehensive security plan in Tripoli came as a result of the increasingly chaotic nature of the conflict, and the waning ability of local and national political actors to manage it. As the Syrian Civil War, intensified Jabal Mohsen and Bab el-Tebbeneh grew to reflect a microcosm of the larger conflict playing out in Syria rather than a battleground for more local and national concerns. The twin bombings in 2013 marked an escalation of the conflict that increased pressure on middle and upper class Tripolitans. Residents feared spending too much time outside their homes, and local businesses suffered. Political leaders realized that if they did not put an end to the fighting soon, they risked allowing it to intensify beyond their control. In April 2014, the Lebanese Armed Forces finally instituted the Security Plan that included a large-scale deployment of soldiers to the neighborhoods party to the conflict (some estimates go as high as 10,000 soldiers), as well as arresting and detaining around 2,000 fighters. Militias surrendered their positions to the security forces in a negotiated truce, and within a day the military controlled most strategic positions in Jabal Mohsen and Bab el-Tebbeneh. Fearing arrest, the Security Plan also resulted in the exile of Rifaat Eid, the head of the Alawite Arab Democratic Party, and his close associates to Syria. After the implementation of the Security Plan, an intense battle between aspiring Islamic militants in Bab el-Tebbeneh and Lebanese security forces erupted in July 2014, followed by a suicide bombing of a cafe in Jabal Mohsen in January 2015. Ultimately the Lebanese Armed Forces were able to subdue the Islamist militants and end the fighting. The abrupt end to the conflict is still the subject of considerable debate fueled by a lack of first hand information and the clandestine nature of the political drivers of the conflict. While experts may be hesitant to definitively state exactly how the conflict ended so swiftly and with such a smooth transition of power, many agree that a political negotiation took place between the major political players controlling the conflict. Since these political players operated largely behind the scenes, it is difficult to know with any certainty what transpired behind the political curtain. In spite of the overall success of the security plan in establishing a stable post-conflict environment and providing space for reconstruction, this peace allowed the other underlying factors to re-emerge, hindering reconciliation. Sunni youth from Bab el-Tebbeneh and its surroundings accused the Lebanese security forces of discrimination in policing as they bore the brunt of the arrests. This included the LAF, which has historical ties to the Syrian regime and Hezbollah. This marginalization created a profound sense of physical insecurity among young Sunni men, who were already at the greatest risk of radicalization. While the Lebanese security forces have been credited with halting the armed violence in Tripoli, and dismantling most radical Islamist cells linked to ISIS or Nusra, these tactics may ultimately escalate tensions, undermining the government’s ability to maintain stability. While it is difficult to determine whether the implementation of the Security Plan resolved the conflict or simply sedated it, the uneasy peace it brought about has persisted for four years. That is not to say, however, that conflict could not reignite given shifting local, national, or regional circumstances even if unlikely in the short term. At the local level, some have suggested that the return of ADP leader Rifaat Eid from exile in Syria under a hypothetical general amnesty law could spark renewed clashes. Similarly, any major action taken against the Alawites in Jabal Mohsen, including larger scale arrests, would likely disturb the city’s already delicate sectarian relations. The return of both Islamist fighters and Hezbollah from Syria after the end of the civil war could also undermine this uneasy balance. Underscoring all of these hypothetical shocks, however, is the Lebanese government’s focus on securitization rather than genuine peacebuilding, reconciliation, reconstruction, and economic development addressing the conflict’s underlying drivers. At its heart, the conflict between Bab el-Tebbeneh and Jabal Mohsen was a proxy conflict framed as confessional competition at both the local and national level. Without accountability within these political factions, a true reconciliation between those who fought and suffered in Tripoli seems outside the realm of possibility. However, tension between Bab el-Tebbeneh and Jabal Mohsen alone, even if significant, would not be sufficient to reignite armed conflict. For the time being, it seems to be in the best interests of not only local actors, but also national and regional actors to keep Lebanon stable in the face of ongoing instability in Syria, and the fragility of the national Lebanese political arena. Only time will tell. Raphael LeFevre, The Roots of Crisis in Northern Lebanon, Carnegie Middle East Center. Rougier, Bernard. The Sunni Tragedy in the Middle East: Northern Lebanon from Al-Qaeda to ISIS. Princeton Studies in Muslim Politics. Princeton ; Oxford: Princeton University Press, 2015. Knudsen, Are John, and Tine Gade, eds. Civil-Military Relations in Lebanon. Cham: Springer International Publishing, 2017. https://doi.org/10.1007/978-3-319-55167-8. I’d should check with you here. Which isn’t something I normally do! I get pleasure from studying a submit that can make individuals think. Additionally, thanks for allowing me to comment!